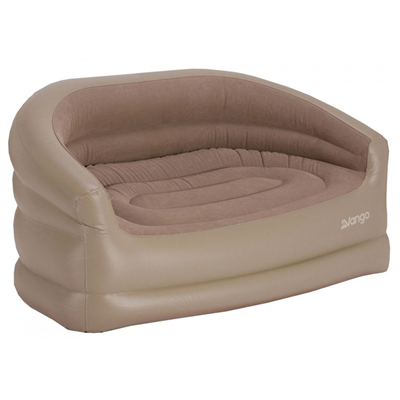 Made to share, the Vango Inflatable Sofa is constructed from strong PVC material for added durability, with a comfortable flocked exterior. Its maximum loading weight of 250kg makes this the ideal piece of furniture for relaxing with friends in the campsite or at a festival, where the Inflatable Sofa creates a home-from-home feel. I never would of imagined you could be comfortable in a field. Super product that fits perfectly inside the Vango Solace 400 in several places. Versatile and comfortable. You must pump them up firmly for the best results. We used the tent pump as the little 12v pump we had was not enough. This is a great couch. It's really comfy and compact when deflated. It's more comfortable that chairs and takes up far less room when traveling ... get one! Just back from 5 nights camping. Inflated the sofa once only on arrival. Could easily have slept on it, brilliant.